Last week in Part 5 we looked at the development of the rear suspension. Now it’s time to examine the frame, seat and chain path. 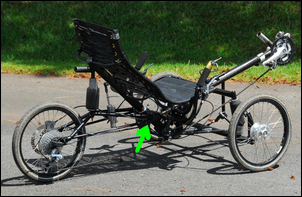 The frame on Chalky, the human powered vehicle (HPV), needs to perform a number of functions. It needs to support the seat, and provide mounting locations for the steering, pedals, and front and rear suspensions. In addition, it needs to provide mounts for the rear carrier, water bottles and rear panniers. It needs to be strong in bending (to support the vertical weight of the rider and luggage loads), specific parts need to be strong in torsion and bending (eg to support the pedalling loads), and it needs to provide torsional stiffness to the front and rear suspension assemblies. The frame and seat also need to disassemble so as to make a small package for shipping, and – of course – the frame and seat need to be as light as possible. 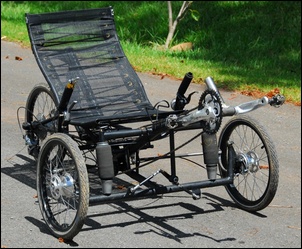 As with my two most recent HPV designs, I chose to base the seat design on the pictured ‘Ergo’ seat built by recumbent trike manufacturer Greenspeed. This design uses a pair of shaped 19 x 0.9mm chrome moly steel tubes that provide the side rails of the seat. These side rails are spaced apart by additional bent pieces of steel tube. Stretched in between the side rails is plastic mesh that is held in place by bungee cord laced through eyelets and running across the back of the seat frame. This seat design gives good airflow, is very comfortable and is light. However, depending on the Greenspeed model, the structural stiffness of the seat is provided largely by the frame to which it is bolted. In my design, I integrate a 44.5 x 0.9mm tubular backbone into the seat frame (arrowed). Furthermore, at 44cm, my seat is far wider than the normal Greenspeed seat (that’s typically a little under 36cm). The use of the 44.5mm backbone tube allows the seat to support large loads – in Chalky, the rear spring, damper and carrier loads are all fed into this backbone. The seat attaches to the forward section of the frame. This frame section consists of a longitudinal 44.5 x 0.9mm chrome moly tube that runs forward as far as the boom extension carrying the pedals. Located about halfway along this section is the right-angled support tube for the front airbag springs (1). This support consists of a continuous length (ie it passes right through the main longitudinal) of 32 x 0.9mm chrome moly tube. A vertical support (2) for the front suspension Watts Link is made from 19 x 0.9mm chrome moly steel tube; the rear mount (3) for the front suspension is made from 1.6mm chrome moly steel sheet. The steering handlebars pivot bush is also contained in the main backbone (4). 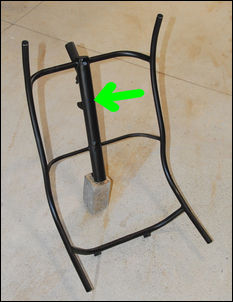 The seat and forward section of the frame attach together at three points. Two forward mounts (5) comprise 10mm high tensile steel through-bolts while the rear mount is a ‘slip joint’ of the sort also used to allow the boom extension (containing the pedals) to be adjusted for leg length. The way the two sections of frame join is very important in ensuring stiffness and strength. It’s easy to design attachment points that are very strong – but also heavy. 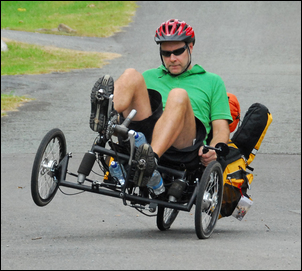 For example, a folding coupling can be used – but the Greenspeed design used in their GT3 trike weighs no less than 500 grams! So rather than using folding couplings, I chose to use a combination of bolted and slip joints – the downside is that trike assembly and disassembly are more time consuming, and require the use of Allen keys. The description above largely covers the frame design and shape. However, when actually building the frame, a few important issues had to be addressed. Firstly, as described in Building Ultra Light-Weight Tubular Frame Vehicles, Part 2, it’s really important that tube loads are fed into the complete tube, not just one wall of the tube. Therefore, the front suspension Watts Link support passes right through the main frame tube, and all spring mounts use tubes that also connect to both walls of the main frame tube support. Secondly, as with the front and rear suspension designs, at this stage the frame was built as lightly as possible – that is, some ‘obvious’ structural braces were not installed. 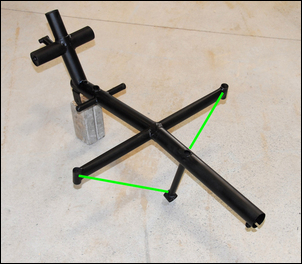 An example of such braces are those (shown here in green) that could join the Watts Link support to the front springs support, triangulating and stiffening both the Watts Link support and the spring supports. By adding another short brace, the boom could also be stiffened. Without a doubt, these braces would make this section of the frame much stronger – equally, without a doubt, they’d also make it heavier! As with the suspension arms, the need (or not) for these braces will be found out in hard testing. Thirdly, as described in Building Ultra Light-Weight Tubular Frame Vehicles, Part 1, it is far better to always use the maximum diameter, thinnest wall tube – rather than going down in tube diameter and up in wall thickness. Thus the support tubes for the rear suspension are in 44.5mm diameter tube, a size that at first glance looks overly large. The weight of the chrome moly frame (including front and rear suspension supports, the boom, seat frame and bolts) is 4.8kg, comprising 2.7kg for the seat and 2.1kg for main frame. 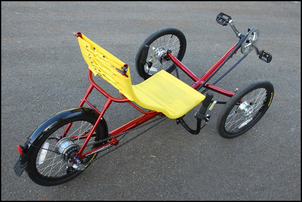 The frame, steering, and front and rear suspension systems were able to be developmentally tested as a complete unit. I am lucky enough to live on a quiet cul de sac at the end of a steep hill, so it’s easy for me to push the machine a little up the hill and then roll down onto the flat area of bitumen where I can turn sharply, run over bumps, etc. In this way, I could assess the steering, the stability and ride comfort. 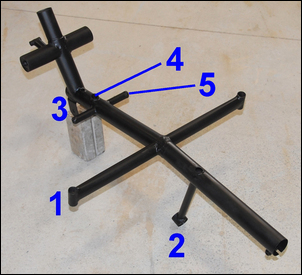 As indicated in an earlier part in this series, when the machine was being cornered, the Watts Link frame support tube (then a temporary 12.7 x 0.9mm tube) could be seen and felt to be clearly bending, so this was upgraded to 19 x 0.9mm and the tube joined to both walls of the main frame tube (the upgraded tube is shown in the pics above). The seat – a known quantity as it’s identical to the one used in my Air 150 previous design – felt fine; the suspension all seemed to be located well, cornering stability was good, and the ride quality excellent – better than expected, in fact, considering the smaller diameter 16 inch wheels. Rearwards front suspension arm flex over short, sharp bumps also did not appear to cause toe changes, a problem that occurred with one of the other trialled steering designs. I then fitted the rear hydraulic disc brake and found that rear suspension extension was small under braking – however, with the mass distribution of the trike biased frontwards (so as to give a better weight distribution when loaded for touring), the rear wheel could be easily locked. I then fitted the front drum brake cables and found that front-end dive under braking was small – but rear suspension extension under front wheel braking was large. That’s not unexpected – the result of the low pitch centre of the front suspension. It was also a problem on the Air 150, partly solved by using stiffer rebound on the rear damper. I don’t know at this stage how much extension will occur with a heavy rear load. The amount of acceleration squat that occurs depends on the location of the rear suspension pivot relative to the centre of gravity. The exact pull line of the chain depends not only on the position of idler pulleys but also on the gear selected on the rear gear cluster, and in fact the overall gearing. Because it all gets complex very fast, by far the best way of optimising the chain pull line is to leave open a lot of options and then to trial them on the road. In the case of Chalky, my experience suggested that the chain pull line would need to be located only just under the rear suspension pivot point. In fact, because things got rather tight with the frame and the steering, if I wanted to keep the chain well away from the road, there was really only one path that could be taken. Even this path (arrowed) had clearances on the tension side of the chain measurable in millimetres – eg 5mm clearances. The return path of the chain is less critical – because it is tensioned only by the derailleur spring and isn’t carrying any power, it can be guided either by plastic tube or an additional idler pulley – the pulley costs only in weight, not power loss. The initial developmental testing with the chain fitted showed that two idler pulleys were needed, the return chain one fitted with a guide to stop the chain jumping off it over large bumps. In terms of rear suspension squat/extension, the chain pull path just below the pivot was OK – but not perfect. If pedalled jerkily (and all this testing was carried out in steel capped boots – what I wear in my workshop – not cleated cycling shoes) then the rear suspension could extend, rather than staying neutral. But that also depended on the selected gear, and the testing was not being done with any extra touring load. I therefore decided to leave the chain path as it was for further, proper, testing. As shown in the pics, at this stage I have chosen to just roughly spray paint the metal parts black. That’s so surface rust doesn’t develop during the more extensive testing that Chalky will now undergo. I’ll now ride the machine in all different conditions, looking for inadequacies in the steering, suspension, braking and frame design. I’ll also build a carrier to allow full touring loads to be carried – that’s two large Arkel RT60 panniers, plus tent and sleeping gear, a max of about 30kg. I’ll also fit water bottle carriers – they sound trivial but they’ll be carrying up to 4.5 litres (4.5kg) and that mass will be positioned well forward. I also want to repeatedly disassemble and reassemble the machine, to find how long it takes when I am well practiced, and what aspects of the design can be changed to make this process easier. I also want to develop a packing process that makes the disassembled trike bundle as small and rugged as possible. I want to ride at speed down the very steep grades where I live, I want to ride at night (so much more faith needs to be put in the suspension, brakes and steering at night! ), and I want to ride normal roads and cycle paths. Here’s a last-minute addition to this story – a sneak preview of next week’s full load testing!